So here we are at the end of another week. Was it a good one for you? Are you ready for the weekend? I am, always. This weekend in particular should be lots of fun. We’re heading out to a local dive with some friends for karaoke. It’s always such a blast. And it’s my husband’s birthday! Over the years I have made him some amazing birthday desserts. He loved this banana cream pie, and this carrot cake was a top favorite too. 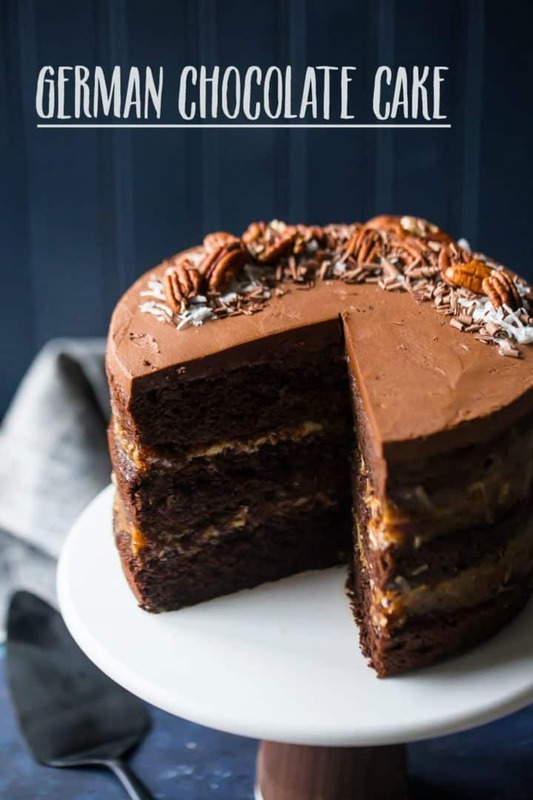 And everybody always goes crazy for this peanut butter cake with chocolate frosting. But he’s always wanted a German chocolate cake, so I figured it was about time I finally give it to him! German chocolate cake is a classic dessert that consists of moist chocolate cake, layered with a buttery brown sugar filling that’s loaded with coconut and crunchy pecans. Honest to goodness, it tastes like a candy bar. The combination of rich chocolate with that caramel-y filling is amazing. There’s actually nothing “German” about German chocolate cake. It gets its name from a chocolate maker whose last name was German. He invented a formula for a dark baking chocolate. Any time I make any kind of chocolate cake, I always begin with my favorite chocolate cake recipe. It bakes up moist and flavorful every time, and it’s got SO much incredible chocolate flavor. Plus it all happens in just one bowl! So of course that is the base. But what really makes German chocolate cake different is the filling. To make this unbelievable German chocolate frosting, combine cream, brown sugar, butter, egg yolks, and a dash of salt in a small pot. Cook the mixture over low heat, stirring constantly, until it comes to a bubble. Allow the filling to boil for about a minute, until you notice it’s thickened a little. Then remove it from the heat, and stir in the coconut, pecans, and vanilla. This mixture might seem a bit runny at first, but allow it to cool for a few hours, and you’ll see that it stiffens up quite a bit. 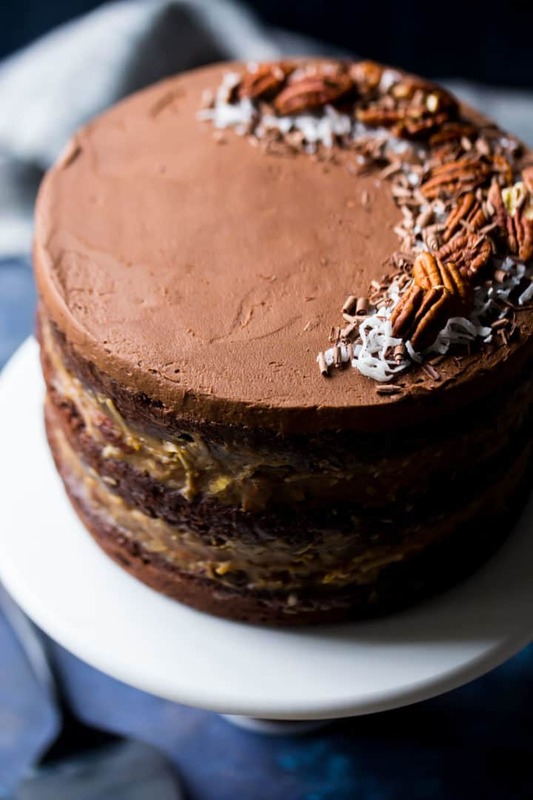 Spread the German chocolate frosting between each layer of this triple-decker beauty, then top it with my favorite easy chocolate frosting. Add a sprinkling of coconut, pecans, and chocolate shavings, for a real show-stopper of a dessert! Your guests will be wowed! CAN THIS RECIPE BE MADE IN OTHER SIZE PANS? As you can see in the pics and video, I chose to bake this cake in three 8-inch diameter cake pans. But you could also bake it in two 9-inch pans. Or, you could bake it in a 9×13 pan, or as cupcakes (see this recipe for the cupcake version: Simply Perfect Chocolate Cupcakes). Any time you bake anything in a different sized pan than called for in the recipe, you just have to watch the bake time. Bake times can vary based on the size and thickness of the cake. You’ll know when the cake is done baking when a toothpick inserted in the thickest part comes out clean. CAN GERMAN CHOCOLATE CAKE BE MADE AHEAD? All of the components of this cake can be made up to a week ahead. Just be sure to keep everything tightly wrapped and refrigerated. The cake itself can be assembled as much as 24 hours in advance. In fact, I think you get the best results when you refrigerate a cake overnight. Somehow everything seems to meld together, and it always slices so beautifully when it’s had a chance to chill with the filling and frosting. This cake will be fine at room temperature for a few hours. If you have any leftovers, just wrap tightly in plastic wrap and refrigerate. The cake will last in the fridge for about a week. Have you got a big celebration coming up? 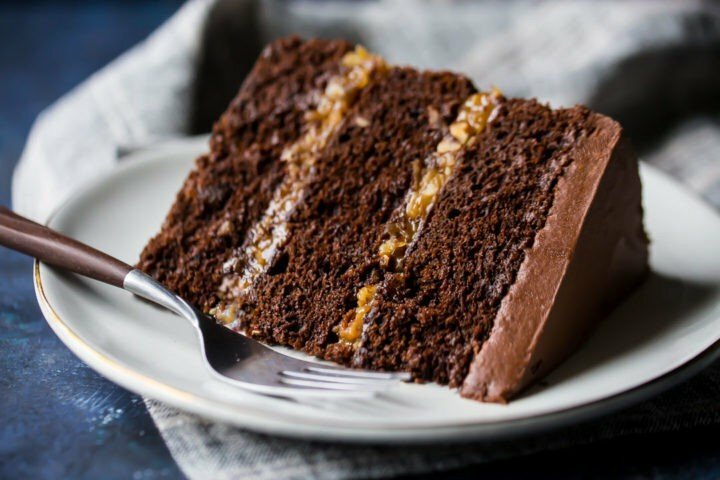 Make it truly unforgettable with this German chocolate cake! Everyone will love it and it will make such a gorgeous centerpiece for your table! Preheat the oven to 325 degrees F, generously mist three 8-inch diameter by 2-inch high cake pans with non-stick spray, and line with circles cut from parchment paper. Cool completely, then fill with German chocolate frosting/filling and top with chocolate frosting. Place the cream, brown sugar, butter, egg yolks, and salt in a small pot over low heat. Cook, stirring, until the mixture comes to a low boil. Continue to cook, stirring, until the mixture thickens slightly (about 1 or 2 minutes). Remove from the heat and stir in the coconut, pecans, and vanilla. Cool completely, then spread between layers of chocolate cake. Stir in the cream** and vanilla, then turn the mixer up to medium-high speed and whip the frosting until light and fluffy. 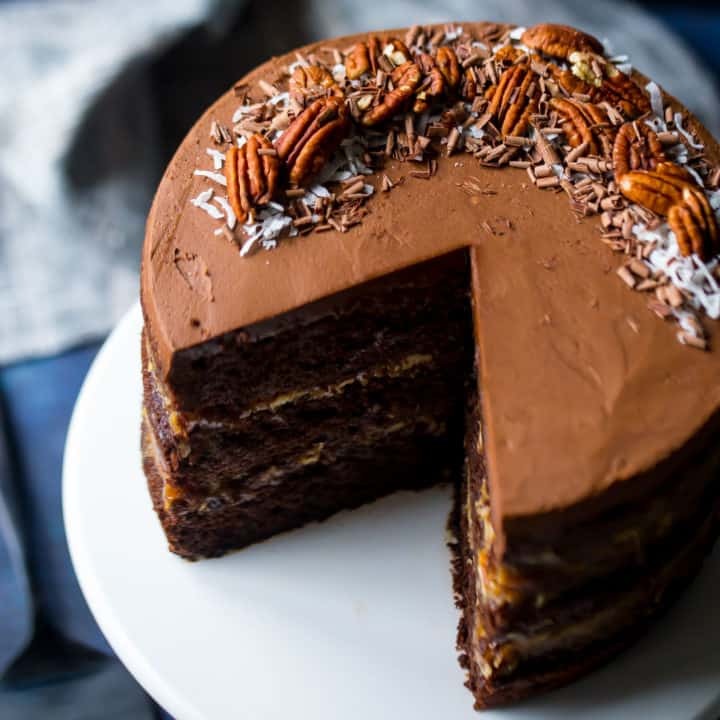 Spread the frosting on top of the cake, and garnish with coconut, pecans, and chocolate shavings. *To make chocolate shavings, run a veggie peeler down the side of a bar of chocolate. **The amount of cream needed can vary. Start with 3 tablespoons and add more if necessary. You just want it to have a nice spreadable consistency, without being too loose or runny. For more info on the chocolate cake, click here: Simply Perfect Chocolate Cake. For more info on the chocolate frosting, click here: Easy Chocolate Frosting. Love the idea of using this for cupcakes too! Gah, I bet I could eat the whole cake haha.